Summer has finally arrived in Vancouver. We have now had a week of sunshine, with weather in the 80’s (Fahrenheit). Radio weather announcers pinch themselves and utter un-jinxing spells before they say: “And the forecast for the weekend… do I dare say it… is sunny.” And the little weather icon, which shows the sun, partially covered by a cloud with raindrops falling from the cloud, keeps moving to the day after tomorrow every day. 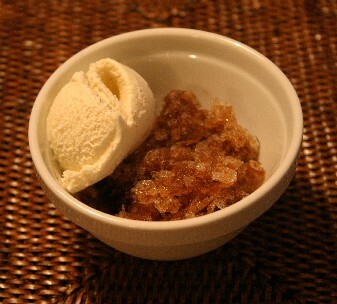 After an afternoon walking around Gastown with two friends from the San Francisco Bay Area, I was inspired to make coffee granita based on this ‘wikiHow‘. The addition of a scoop of vanilla bean ice cream made for a perfect summer dessert. Then, two weeks ago, our friend Ellen Bermingham reported a mother and two kids picking berries in Pacific Spirit Regional Park during her afternoon run. What were they doing? It is way too early for blackberries. 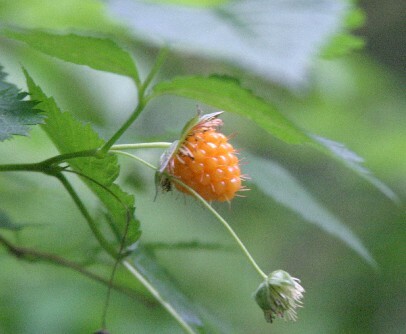 On Saturday, we saw what looked like yellow raspberries while hiking in Capilano River Regional Park with Tim Ryan and Rissa. 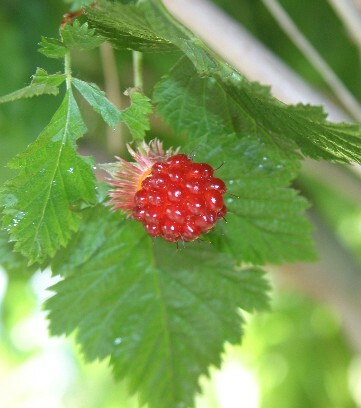 And yesterday, Mark saw several groups picking what turned out to be salmonberries on his mountain bike ride through Pacific Spirit Park. Aha! 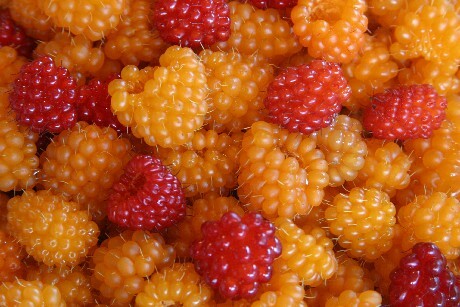 Salmonberries (rubus spectabilis). Who knew? Today, we grabbed what containers we had and hopped on my scooter to go berry picking. A mother and two kids (perhaps the same ones that Ellen saw?) were already at one spot close to the road. We forged on further ahead, wading into thorny thickets yet untouched. 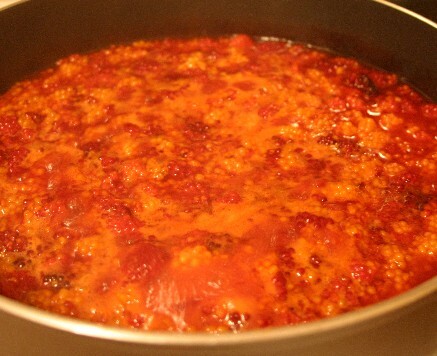 We found both the yellow and red fruit – enough to fill the three containers that we had brought, hoping that we had at least 6 squashed cups worth. 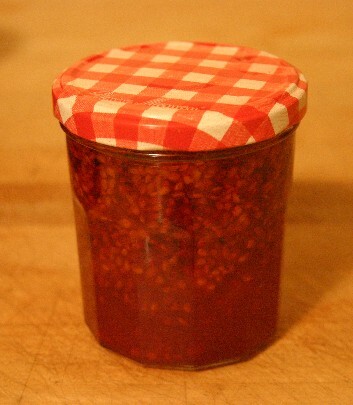 We emptied out all the jam and mustard jars we had, sterilized them, decided on a fruit to sugar ratio, boiled the fruit with sugar and pectin, filled the jars, boiled them once more to create a vacuum seal and viola – our first attempt at jam.